Cheat sheet: Which shutter speed should you be using? The ability to regulate shutter speed is one of the key ways in which we can decide how an image turns out. The right shutter speed will help to freeze subjects in motion to make sure they're sharp, or alternatively, blur them sufficiently for creative effect. For everyday shooting, it's also useful to know the lowest shutter speed you can get away with for a particular lens, in order to keep image quality as you'd expect. Much like aperture, you can leave this all to the camera if you like, but sooner or later you may start to feel like you're not getting the kind of images you want. Your camera may be getting it right for everyday images, but there'll be occasions where you may want to take control into your own hands. So, when should you use slow shutter speeds and when should you use faster ones? As a general rule, you should try to stick to the faster end of the scale when shooting moving subjects, ones that you want to remain sharp. So, when shooting sports or people moving around, for example. Slower shutter speeds, meanwhile, are sometimes necessary when shooting in low light, although you may also want to use these when using a tripod. In such a situation, you may choose a slow shutter speed so that you can use a small aperture, in order to keep everything in the scene focused. Alternatively, you may want to blur the motion from water, traffic or clouds – and for this, a tripod is pretty much essential. There are exceptions to these rules. You can, for example, use a relatively slow shutter speed with a moving subject when using a technique called panning. Here, you move the camera in tandem with the subject, so that you end up capturing it sharply against a blurred background. So how do you change shutter speed? Simply head to your camera's mode dial and turn it to the Shutter Priority option. Depending on your camera, this should be marked Tv or S. You should now turn a command dial on your camera, close to where your shutter-release button is, which should adjust this shutter speed through the available range. 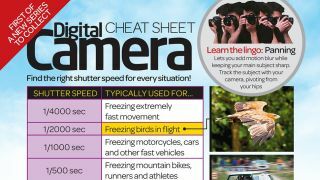 Our cheat sheet will give you a few more ideas and tips on using the right shutter speed in different situations. Keep it to hand and never be lost again!